Flared window reveals reduce glare, allow more light to enter room. Walnut window stool, clay plaster. Earth floors with clay plastered interior walls provide distributed thermal mass for passive solar heating. 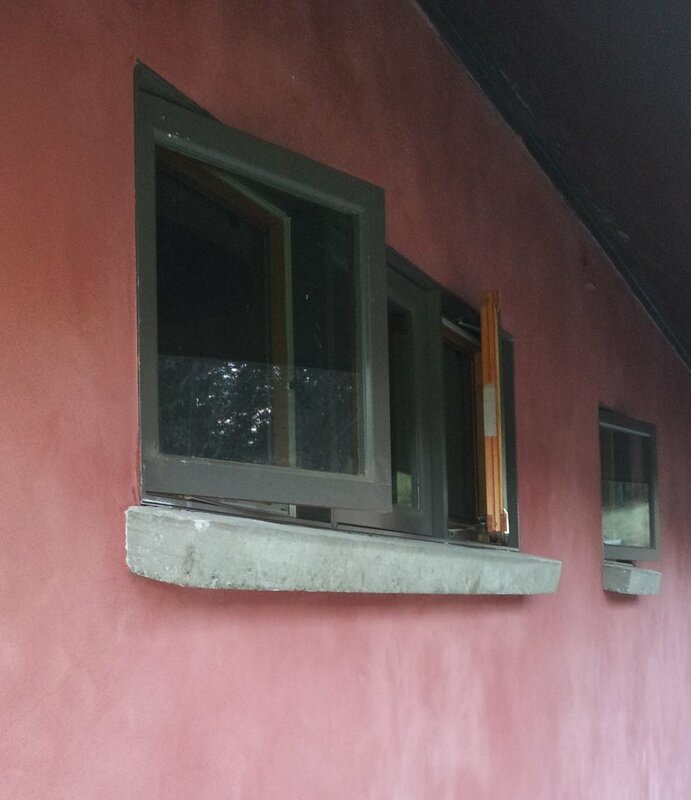 Lime plastered exterior of passive solar straw bale home. Tiled back splash reduces wear-and-tear on interior clay plaster below window. I-Joist or LVL type of post-and-beam system uses 3-string bales stacked on edge (15" wide) for maximum insulation value per inch of wall thickness. Uses straw bale shear wall and interior partition shear walls. 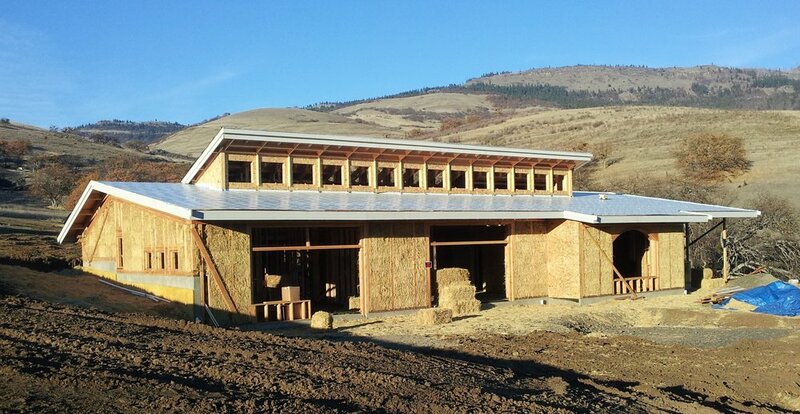 Passive solar straw bale house uses both straw bale shear wall and interior partition shear walls. Lime exterior and interior plasters. 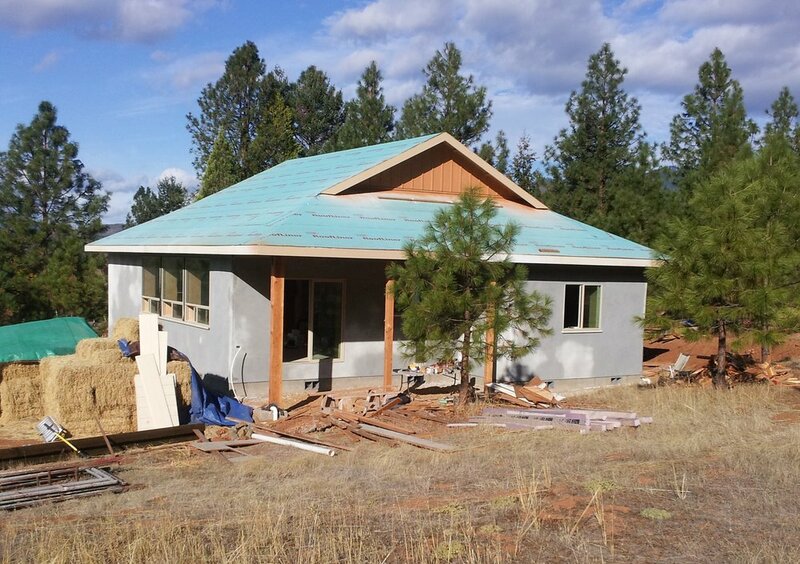 Passive solar straw bale home uses straw bale shear wall and interior partition shear walls. Lime exterior and interior plasters. Passive solar straw bale house using prefabricated steel brace frames for shear. Cedar window sills extend well beyond wall plane. Ferrous sulfate wash over lime-cement plaster produces mottled yellow-orange color. Conventionally framed and sheathed dormer adds light, thermosiphon for summer cooling. Extended eves protect lime plastered straw bale walls below. Conventional framing and insulation in gable triangle. Gable window vent accessible from loft. Earth floor and clay interior plastered walls supply distributed thermal mass, store heat from the sun.